Step 1: Prepare the prawns. Heat the olive oil in a frying pan and add the onion and the garlic. Sauté for 5-6 minutes until they soften and add the prawns. Continue sautéing for another 3-4 minutes and pour in the ouzo. Wait for 1 minute until the alcohol evaporates and then add the salt, the pepper, the fresh tomato sauce and the tarragon. Mix and cook for another 10-15 minutes. Step 2: 2-3 minutes before the end of the cooking process, add the feta cheese and stir. Wait for 5 minutes so that the food cools off and serve. 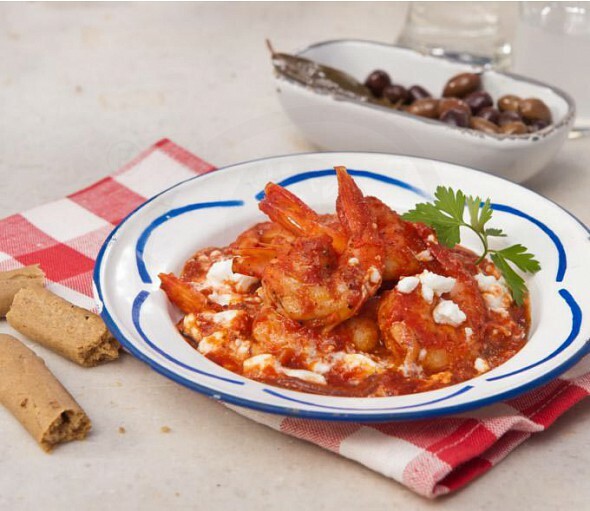 A seafood meze which can also be served as an appetizer.